It has a 10-core Mediatek X20 chip, which is being used in new mobile devices from companies like Meizu and LeEco. The board comes with Android 6.0, and it's not yet known if it will be upgraded to Android 7.0. There still isn't much need for 10 CPU cores in smartphones or tablets, but the developer board could put the chip to good use. Quad core chips are considered powerful enough for handsets. The board also uses a Mali-T880 graphics processor, which is in Samsung's latest Galaxy S7 handsets. The GPU is capable of 4K video playback and recording in the HEVC and VP9 formats, so it could be used to run mobile virtual reality apps. The board has many other potential uses. It can be used as an Android PC, which can be hard to find, or as a file or media server. It can be a test-bed for developing mobile applications. It can also be used to make robots, drones, and smart home devices. MediaTek wants to put the 10-core X20 chip in more products beyond mobile devices, and the development board will help, Stephane Le Provost, senior technical director at MediaTek USA, said Tuesday during a technical session at the Linaro Connect developer conference in Las Vegas. Like Raspberry Pi, Mediatek is targeting vertical markets like point-of-sale systems, medical devices, and industrial equipment. As IoT expands to billions of devices, developer boards are drawing interest as a way to create and prototype devices. 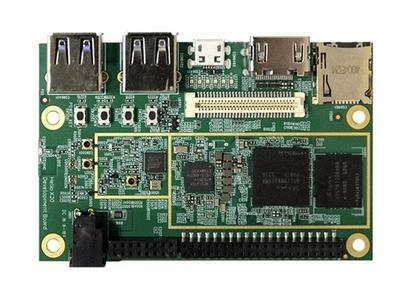 At $199, the MediaTek X20 Development Board is much more expensive than the $35 Raspberry Pi, which has a quad-core ARM 64-bit chip and can also be used as a PC replacement. But if you like the latest and greatest technology, the Mediatek board could be worth it. The Mediatek board includes 8GB of internal storage, 2GB of DDR3 memory, and two USB 2.0 ports. Wireless features include GPS and Wi-Fi a/b/g/n. The board has an HDMI display outlet and an interface to attach a 25-megapixel camera. The board's CPU has two of ARM's latest Cortex-A72 CPU cores running at speeds up to 2.3GHz, four Cortex-A53 cores running at 1.85GHz, and four more Cortex-A53 cores running at 1.4GHz. The goal isn't to use all 10 CPU cores at the same time but to use the cores at the right time, Le Provost said. The Cortex-A53 cores can be used for mundane tasks like music playback, or media serving, while the powerful Cortex-A72 cores can be used to crunch more demanding applications.